A wearable camera full of sensors could help people with memory problems, according to Microsoft researchers. The prototype SenseCam takes an instant snap every time it spots changes in movement, temperature or light. 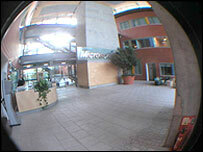 Currently capable of storing 2,000 images on a 128MB memory card, the cam could help people record their days. The technology has been developed by the Microsoft Research laboratories in Cambridge, UK, and is to undergo tests at Addenbrookes Hospital this summer. "SenseCam has been designed to act like a black box for the human body," lead researcher Lyndsay Williams told BBC News Online. "It was something I originally created as a method for helping my family find their keys at home. "It's so frustrating trying to re-trace one's steps so I build a device which would help find a solution to this problem." It also seems to be potentially the ultimate way to keep a visual blog, or diary, of your life. The camera uses accelerometers to detect motion, passive infrared to detect another human being, and digital sensors for light and temperature monitoring. It could do more than give everyone a photographic memory. Although Microsoft has no plans yet to take the camera forward into product development, Cambridge's Addenbrookes Hospital is planning to test-run the gadget with patients. "The SenseCam project could provide certain patients suffering from memory loss with the ability to keep a visual diary of their memories and, potential, improve their quality of life," said Dr Narinder Kapur from the hospital. Indeed, the hospital had originally approached Microsoft's newly-formed Interactive Systems Group to see if they had any useful tools they could use, said Ms Williams. Many patients who have suffered brain damage, through accident, illness, or old age, are often asked to write detailed diaries of their days, Ms Williams explained. This, she said, can be extremely difficult for some, especially children. The SenseCam could be a quick and easy way to record, rewind, and relive events. All the sensor data which triggers the cam's image capturing is recorded and fed into a system called MyLifeBits, another Microsoft project based in San Francisco. 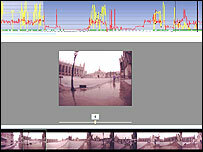 It organises all the captured images like a filmstrip which can be watched back and easily searchable. The images are also matched against graphs of the various bits of sensor data for wearers to pinpoint which moment in time, or location, they wish to watch again. The playback happens at 25 frames per second, called Rapid Serial Visual Presentation (RSVP). The device's function is reminiscent of the 1990s science fiction film Strange Days, in which memories are recorded and experienced by others. But the SenseCam is a long way off from that just yet. Its basic look belies its function at the moment. 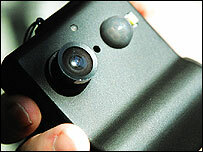 With its 132-degree wide lens, and various sensors, it is a hi-tech little box. But its looks are not of concern Ms Williams and her team. The aim of the project is to understand how people accept innovative technologies into their lives, she explained. "It helps us understand the responses to new methods of computer interaction. Investigating the sociological effect of new technology is all part of the research process." It has some potential uses outside the lab and the hospital, though. "For example, fire-fighters could use a SenseCam device to help retrace their steps for post accident reports, reducing the potential for inaccuracies when identifying the cause of fires," she said. Tourism is another area which could potentially exploit this kind of memory recording, relieving tired hands of video-camera recording. Each family member could even have their own version of the holiday. Future plans for it, said Ms Williams, include reducing its size, making it wireless and more power efficient. But wider plans include integrating a near infrared lens, like that used on the Mars landers. This means the camera would be able to record more than the eye can see. Water would appear black and chlorophyll would show up white, which could have applications in checking whether food is fresh or not, said Ms Williams. A peripheral head-up, or head-mounted, display could also be attached so that wearers could "fly through" their memories.